Stock Images is a premium Magento theme that is specially designed for online stores selling digital downloads such as for images, wallpapers, logo icons, website templates etc . The theme comes with multiple navigation options as well as a homepage image slider for your featured products as well as attractive jQueryLightbox effects for your product images. 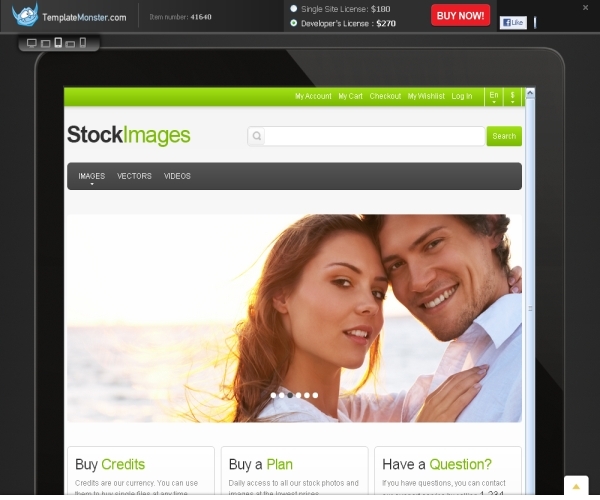 The homepage comes with a primary full-width image slider for your featured images, deals and promotional banners. You can customize the slider options from the theme option panel and can choose from multiple slide transition and timing effects. The rest of the homepage comes in a default 3 column grid for your featured products. The widget ready sidebar includes a tag cloud, user poll and also an opt-in box for newsletter subscription. Navigation options include a primary sidebar menu which can easily contain all your categories and associated products. The theme also has a keyword search box in the header along with an advanced search facility that allows users to search with multiple attributes. The theme also has an additional menu in the top header for account management links, apart from a provision to add internal quick links in the footer. Internal product pages can have multiple product images along with custom magnification effects by using an magnification slider . You can also include product reviews, tags and can also allow users to compare between multiple products and also create a wish list of products. A Related Products extension automatically populates related products as per the current selection. In case you wish to sell digital downloads, the theme requires users to register within the site after which they would be getting a custom dashboard from where they can manage their account. Digital downloads would show as a separate link within their dashboard. Users can also submit product tags and reviews.